A Tree is a collections of Notes/Shortcuts/Favorites. The Tree must be attached to a Tree Type Category. A Tree which is attached to a Tree Type Category can be changed to another tree easily. With Tree Type Categories, it is possible to have an unlimited number of trees in the 8start Launcher. To maintain a compact appearance for the 8start Launcher tree, there is no add/delete/edit/move icon shown in the Tree window. 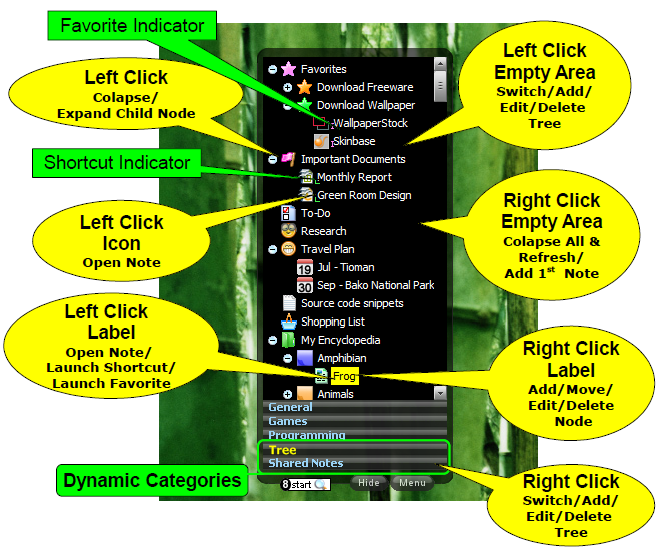 By using a mouse click on icons, it is faster and easier to manipulate Trees and Notes. - Create more than one Tree Type Category if you want more than one tree to appear in 8start Categories. * It is not necessary to create a Tree Type Category for each Tree, one Tree Type Category can hold unlimited trees. - Define the tree name, folder to keep the notes, and notes color. * Tips: You can use free online service Dropbox to store notes / favorites online, and access them everywhere (eg. from Home computer and Office computer). Just point the "Folder to Keep Tree Content" to your dropbox folder. * Notes/Shortcuts/Favorites will not be deleted when you uninstall 8start Launcher or delete a Tree, this is to avoid accidental loss of your valuable data. You can delete any or all of your Notes/Shortcuts/Favorites by using Windows file explorer. 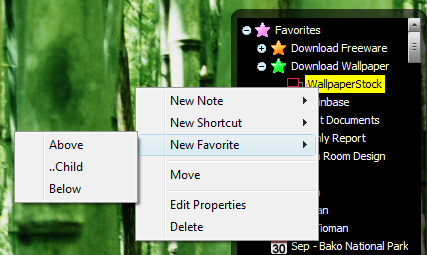 - You can change icon of a 'Note' by clicking on the icon, icon of 'Shortcut' and 'Favorite' is generated automatically, so you can't change it. * The description inputed will be shown in tree window, when mouse hovers over the note label. 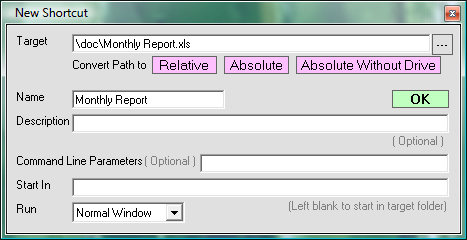 * In some old computer, display of notes label in Tree become slow if opacity changed to the value below 100%. Set Opacity back to 100% to solve this problem.